It was with great pleasure that I received this morning the September/October edition of Resurgence. It is always a happy moment when this ecological journal ('at the heart of earth, art and spirit') lands on the doormat, especially so this time, as a short story of mine appears inside. 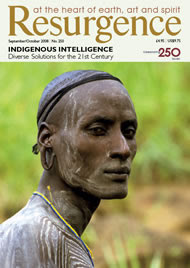 The theme of this celebratory 250th issue is indigenous cultures around the world - how such peoples, the true stewards of our imperilled biosphere, can offer ancient solutions to 21st Century crises. Resurgence is a valuable publication that deserves a wide readership. It understands that our environmental crisis is moral and intellectual as well as scientific and economic. It also knows that eulogy can be more effective, as a spur to action, than elegy - even if sometimes it seems impossible to do anything other than lament what we're doing to ourselves. If you've never seen Resurgence, please visit their website and download a free, trial copy. Or even better, take a subscription. It is a good thing.